I had a dream the other night that Gina had gone missing. I went to the sheriff to report a missing child. But the newspaper lead for the story was “Winter Park woman missing”. Cancel my call to Dr. Freud. I think I figured this one out. Sunday Gina and I went to see the touring company of Chicago at Orlando’s Bob Carr center. It was the final performance before they moved on, and our tickets were perhaps the best I’ve ever had at the Carr – orchestra center just 10 rows back. Sight lines were ideal and I had no use for the opera glasses I brought along. The Carr was nearly sold out. I was a little surprised at the minimal staging. The set was only a bandstand, and there were no costume changes. However I read up later and found that this staging was characteristic of the 1996 Broadway revival of the show, which is still running today. The original opened in 1975. Popular thought is that the show resonated more with audiences in the 90’s era of celebrity criminals like OJ Simpson. To me it brought to mind the media appetite for our local Casey Anthony case, a pretty young woman suspected of a particularly heinous murder. The touring cast was polished and first rate. Bonnie Langford was a little oldish for the part of Roxie Hart, but both she and Brent Barret (Billy Flynn) appeared in the Broadway revival at one point. Langford is a Brit, best known as one of the 1980’s Dr. Who companions. All cast members had near invisible body mics which were almost perfectly mixed from where I was seated. The onstage band included a banjo player. It was nice to hear some songs that were cut from the 2002 movie. chillin’ in the shade waiting for the evening bite. 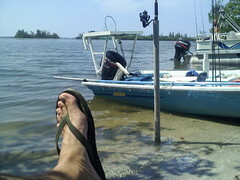 I was out Saturday fishing the Long Point area and planning to spend the night. Fishing was pretty good in the morning. I took a break from the midday heat and headed out again in late afternoon. I wasn’t having any further luck with artificials, so I cast netted some small baitfish. I had one terrific long run on the bait that threatened to spool me, but it broke off and I recovered most of my 30lb braid. Other than that, I was getting small catfish on the baited pole. One of those cats was my undoing. Near sunset I was removing a hook from a catfish held firmly in my right hand. The hook came out with a snap and the catfish barb went deep into my ring finger through the callous worn by my wedding ring. I freaked out. The serrated barb was stuck fast and deep. After a couple of tries, I ripped it out. Blood was flying all over the front of the boat. I wrapped the wound in a dirty rag, pulled anchor with one hand, and fired up the motor to return to the ramp. While under way, I called Linda and asked her for research on dangers of catfish barbs, and the nearest ER. I started getting quite woozy and became concerned that I might lose consciousness. But I made it back to the campground in about 15 minutes, and staggered over to the adjacent campsite to ask for help. Turns out that neighbor Ron is a Vero Beach firefighter, he concurred that I would need stitches, and he offered to drive me to the hospital in Sebastian, about 18 miles away by roadway. Here’s an irony; my location when the accident happened was no further than a half mile from that same hospital. 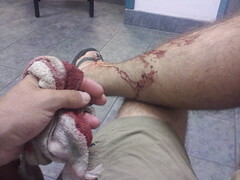 I could have anchored, waded to shore and walked to the ER in less than 15 minutes. When I did arrive about an hour after the 7:30pm accident, they cleaned my hand, cut my ring off, and discovered the barb had fully pierced my finger. I certainly did more damage pulling it out than it did going in. Wish I had not panicked. Xrays showed that “self-administered foreign object removal” was completely successful, as the pretty young ER doctor phrased it. She declined to stitch the wounds up citing the danger of infection. They bandaged me, put a splint on the finger, dosed me with tetanus and antibiotics and discharged me. Ron was waiting with a cheeseburger for me. What a guy. I have his wife’s business card, so I will send him a thank you note with a medical update. 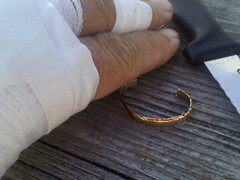 ER personnel had to cut off my ring. After a somewhat fitful and sweaty night sleeping in the car, I got up Sunday about 7am, made a pot of coffee and hung out enjoying the beautiful morning (and updated facebook via my phone.) Ron had left for an early morning shift, so I waited for his teenage son to arise to help me load up my boat. At 9am Anthony was up, and he brought my boat around to the ramp and did the (literally) heavy lifting of getting the boat back on the trailer and unloaded. I was home by noon, filled my scripts, and I’ll see my doctor for a followup on Tuesday. 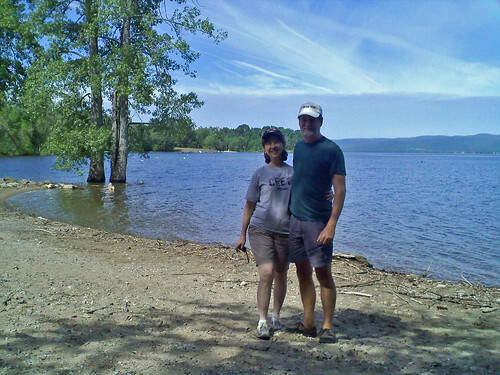 Gina’s final crew trip and regatta was scheduled for last weekend in Saratoga Springs NY. Linda and I have both done our share of volunteering with the Booster club over the years, and we were off the hook for this one. So we planned to attend and get in some sightseeing in the process. We booked tickets on the same flights as the team, and the boosters had some left over rooms so we took one in the same hotel as the team. We all flew up to Albany International last Thursday morning. The team loaded into buses and headed for the race site. Linda and I dallied in downtown Albany for lunch. We dined al fresco in a downtown park surrounded by the massive old government buildings, and mingled with the lawyers and lawmakers in the extremely pleasant weather. Afterward we poked around in the public areas of the legislative building and oohed and ahhed over the bizarre (rococo?) staircases and ornamentation. We took a side trip on the way to Saratoga and stopped at Saratoga National (battlefield) park. There was a great visitor center with helpful rangers, and we learned that it was the location of a pivotal set of battles in the revolutionary war, and Benedict Arnold was a central player. I also learned more about the use of cannons as an offensive and psychological weapon in field combat, and that’s not a pretty story. Finally to Saratoga Springs, which we found was a lively town with a long history of tourist hospitality for both the spas and the horse track. There are lots and lots of great bars and restaurants. The National Scholastic regatta was in Fish Creek just a few miles out of town. Before the Friday afternoon races, Linda and I took an auto tour through the Adirondacks and found the wild recreational headwaters of the Hudson river. We were relying on Verizon cell phone navigation, but we ended up driving way out of service range, and up a long dead end road. Nonetheless, we made it back to the race site in time for our time trials and the five 8-person boats from Winter Park HS crew all qualified for the semi finals, so everyone was upbeat and optimistic that night. We spent most of Saturday at the race site, and cheered on our Winter Park boats successfully through the morning semi-finals. Our team had staked out an excellent vantage point on the riverbank at the finish line. Gina’s lightweight 8, and Jen’s varsity 8 both had white knuckle come-from-behind finishes that left many Winter park parents in tears. Ultimately, all 5 winter park boats qualified for the afternoon finals, and the boys varsity, the boys second varsity, and girls lightweights all medaled. Gina was thrilled to end her rowing career on such a high note. There was a state park next door to our motel that featured continuously running spigots with fresh spring water. 1 of the 4 spigots was labeled MINERAL, and it was pretty nasty. The others were clear crisp tasteless water. The tap water at the motel was equivalent and we filled our gallon jug from both sources. Saturday evening we visited some local gardens and strolled the Saratoga nightlife scene with some other crew parents, but didn’t stay out late because our return flight with the team was very early Sunday morning – we had to get going before 5am. The team bus pulled out ahead of us, and we caught up at the airport. Gina and friends bumped into Flava Flav at that early hour and got a quick snapshot with him. Flickr photos below, and photoset here.